Tom Ford Lip Color Shine features a blend of soja seed extract, Brazilian murumuru butter and chamomilla flower oil to condition and moisturize your lips while draping you in a veil of high-shine color. My local Nordstrom has a small - reallly small - Tom Ford counter which up until recently had only the perfumes. 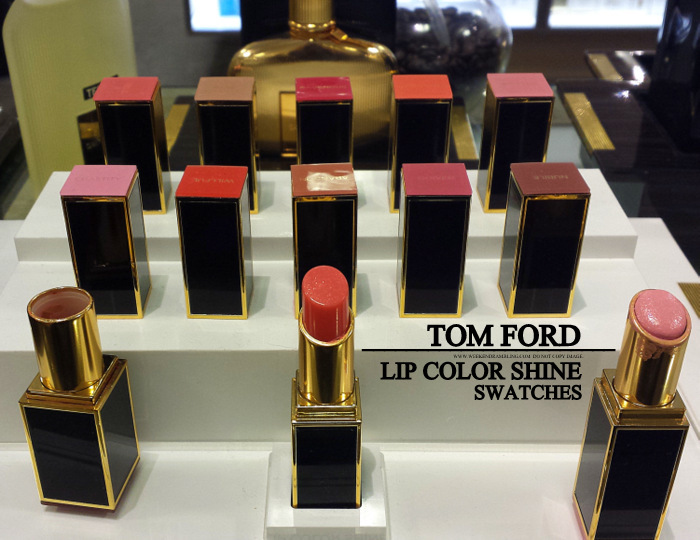 A few weeks back, I noticed the Tom Ford lipsticks turn up, and today, I found the Tom Ford Lip Color Shines. Am hoping the Tom Ford brushes will be next! Anywhoooo, I got swatches of the lipsticks today to share. The Tom Ford lip color shines are creamy and smooth, and at least a few of these also seem to have quite a lot of pigment in them. Bare and Nubile are part of the Tom Ford Holiday 2013 makeup collection. No, I didn't buy it this time, but I do have my eye on Ravenous...isn't it the best? !